From my arrival at the old Central Station, I skimmed the edge of Delft, the Netherlands, heading toward the 15th-century East Gate, the only original city gate remaining — the others were demolished in the 19th century. Around 1510, the gate’s towers were enhanced with an additional octagonal floor and high spires. It currently serves as an art gallery and a private residence. What it must be like to live there, I thought dreamily, as I passed through and entered the heart of what quickly became one of my favorite Dutch cities, filled with dozens of things to see and do. These are my favorites. My fascination with this gorgeous church began with its very curious origins. In 1351, a beggar named Symon was sitting in the Markt square when one Jan Col gave him something to eat. A bright light suddenly shone onto Symon’s face, and he said to Col: “Oh, my dear chosen friend, do you see the Heavens opening?” They both looked up toward what was then the gallows field and, in a vision, saw a golden church dedicated to Mary. Symon died shortly afterward, leaving Jan Col to hound the city council into building a church on that very spot. Col saw the same vision every year for 30 years, until the stubborn council finally yielded to his request. (Later, it would emerge that the “visions” were merely will o’ the wisps.) Construction of New Church began in 1381 and was finally completed in 1655, having endured a devastating city fire in 1536, the Iconoclasm, various renovations, and the Delft Thunderclap, when, in 1654, 90,000 pounds of gunpowder exploded in Delft’s secret gunpowder depot, causing the church’s walls to dislocate, its windows to shatter, and its roofs to collapse. The soaring spire was added in 1872, replacing the two that preceded it — at 357 feet high, it’s the second-tallest church tower in the country. The blackened top gives the impression of fire damage, but it’s really acid rain that has caused the sandstone to darken. Today, the church boasts a 3,000-pipe organ from 1839 (still in full working order) and memorials for six members of the royal family, including William of Orange. Brightly colored stained-glass windows filled New Church as far back as the Middle Ages, but the 1536 fire and the Delft Thunderclap destroyed all of them. 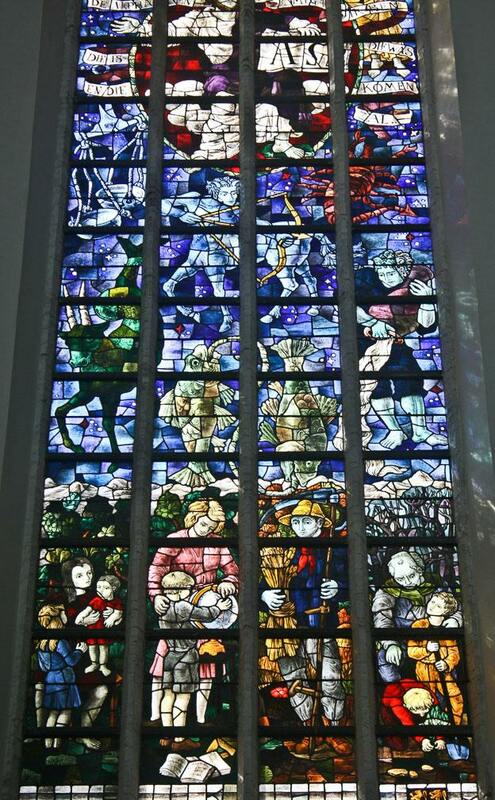 The current windows, added in the 1900s, depict Biblical themes or are memorial windows that commemorate important Dutch events and people. Despite that heavy history, the church feels light, airy, and spacious, and it’s positively remarkable. When I learned that the city derives its name from the canal along which it was founded (the Delf, which stems from the word delvin, or digging), I suspected that Delft’s canals would be particularly engaging. And I wasn’t disappointed. 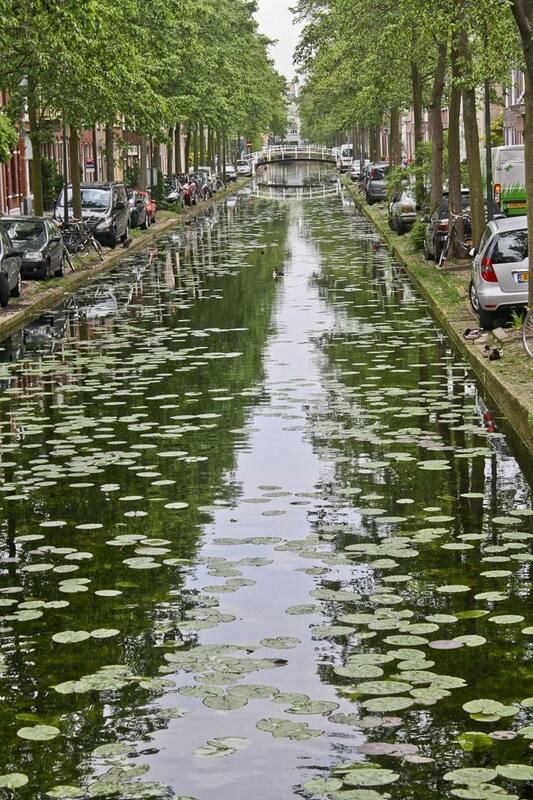 Passing through the East Gate, I entered the city directly onto a canal, spotted with lily pads and a wading heron. Throughout the city center, lovely short bridges arc over the picture-perfect canals, nowhere near as busy as their counterparts in Amsterdam, helping to lend this city a more relaxed vibe. Reflections of the trees flanking the canals and of the canal houses (not as grand as those in Amsterdam, but utterly charming nevertheless) with blooming flower boxes shimmer in the water. Bicycles leaning against the railings reminded me of the preferred mode of transportation here, and cars parked right at the edge made me wonder how many accidentally went a couple of inches too far and ended up in the drink over the years. Benches along the way invite you to just sit and take it all in, best done while snacking on some Gouda cheese and stroopwafel that you just purchased at one of the canalside shops. The striking Maria of Jesse Church, completed in 1882, features two towers (the left resembles that of New Church, while the design of the right is derived from Old Church) that rise up above the city’s skyline and beckoned me to them. But it’s really the inside that made this place so memorable for me. 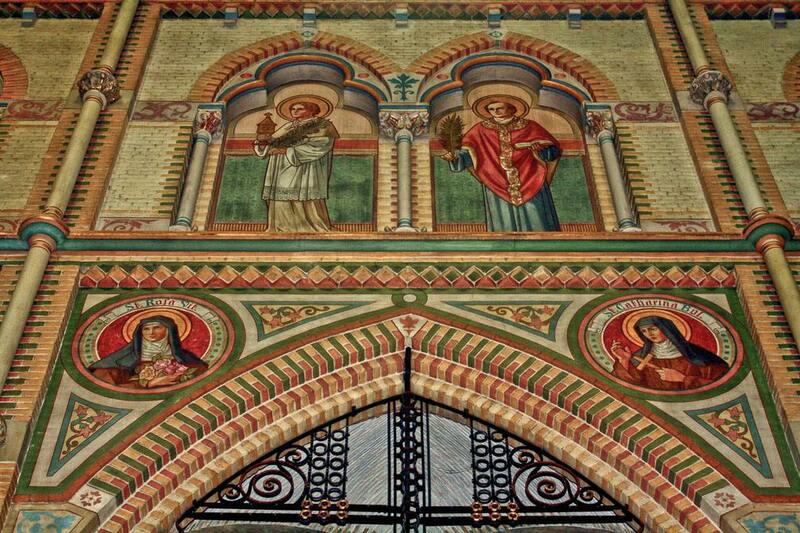 The interior was quite sober until 1905, when the walls received a vibrantly colorful paint job (most noticeably, the red, yellow, and green bricks) and were decorated with finely executed murals of more than 100 prophets, apostles, order founders, martyrs, and bishops. I took a seat on an unexpectedly uncomfortable low-backed pew to marvel at the grandeur around me. The pulpit borders on flamboyant, and the vaults feature angels, dragons, and floral motifs. For a number of the countless saints depicted around the church, the painters used prominent Delft citizens and priests as models. The monumental organ, built in 1892 with 2,222 pipes, was later restored and extended to nearly 2,400. The expertly executed stained-glass windows capture every detail of their subjects, from lily petals to the individual hairs of a balding saint, and the groin vault ceilings of the side aisles sport delicate floral stenciling. The church’s most famous prize is the statue of the Virgin Mary that originally stood in Old Church, where a miracle occurred in 1327, and that was acquired here in 1939, but my favorite feature was the expressive bas-relief Stations of the Cross — some of the best in the world. I first spied the leaning tower of Delft when I was strolling along one of the city’s canals. Officially founded in 1246, Old Church has always stood directly on the canal, and when plans were made to add a tower, there was nowhere to put it. So the canal was diverted and filled in, and the tower ended up partially built on top of a former canal — not exactly a sound foundation for the heavy stones of the tower, which started to tilt even as it was being raised. The builders stabilized it and then carried on building straight up. The crooked tower — referred to as “Scheve Jan,” or “Crooked John” — has been fully stabilized, but for a long time, people in Delft lived in fear of its collapse, so much so that in 1843, the city council wanted to knock it down. Following a public outcry, the council shelved that plan, and so the tower still stands today: 246 feet high, and almost 6.5 feet off center. The tower houses the Trinitas bell, which weighs almost nine tons and has a diameter of about 7½ feet, making it the largest historic tolling bell in the Netherlands. These days, it is rung only for royal funerals, much to the relief of nearby residents, who report that their teacups tremble in their cupboards when the bell tolls. 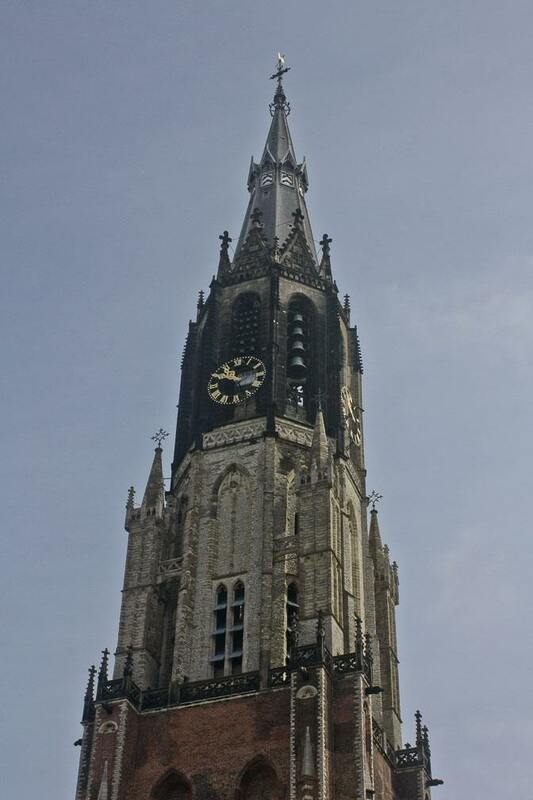 Over the centuries, Old Church developed into an impressive Gothic basilica, yet it retains a medieval feel. In the 15th century, another series of expansions began, and the early 16th century saw the addition of the northern transept, which still remains distinct from the rest of the church. But the 1536 fire, the Reformation, and the Delft Thunderclap (which destroyed the windows) halted further work. Reconstruction began soon afterward, but many of the stained-glass windows were either bricked up or replaced with plain glass. It was not until the mid-20th century that new, richly colored stained-glass windows were installed, and the church now features 27 of them — some are secular, depicting the signs of the zodiac or Dutch sailing prowess, but most are Biblical, illustrating everything from Moses in a basket on the Nile to the Last Supper. The largest of the three pipe organs, with 2,832 pipes, was built in 1857 and is still used every Sunday. Among the tomb slabs on the floor, I found the one under which painter Johannes Vermeer was buried in 1675. The Iconoclasm destroyed virtually everything considered Roman Catholic in the church, but the main pulpit (1548) — one of the finest in the Netherlands, featuring one panel for each evangelist, plus one for John the Baptist — was spared. If you’re going to purchase anything while you’re in Delft, or in the entire Netherlands, for that matter, make sure it’s some Delftware. The unmistakable blue and white pottery began its life in the 1500s, borrowing from the Chinese porcelain of the 14th century. Originally tin-glazed pottery, today you will more likely find the products without the tin, which involves a more expensive process. Nevertheless, the hand-painted Delftware will charm you right out of some euros, and I happily succumbed to the enticement. The pottery comes in all shapes, sizes, colors (although the blue and white remains my favorite), and objects, including bowls, plates, tiles, Christmas ornaments, figurines, and the unique tulip vases, created during the country’s mania over that particular flower. 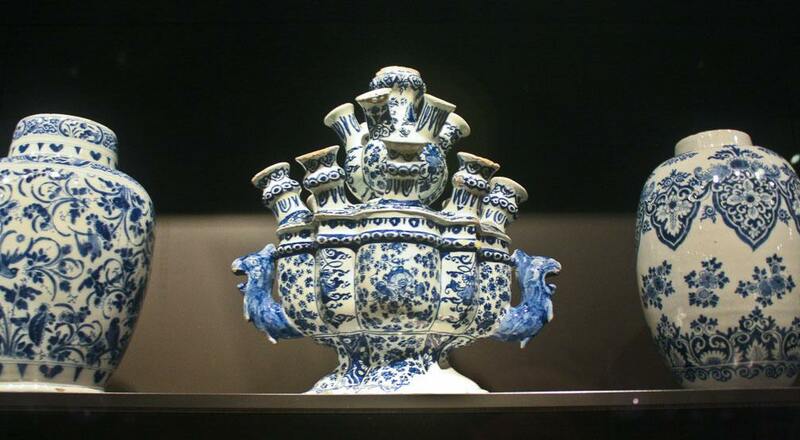 Delftware became so popular that you can find examples of it throughout the world, from museums in Russia, Japan, and the United States, to the walls of the swimming pool in Munich’s Nymphenburg Palace and the walls of a toilet in Copenhagen’s Rosenborg Castle, to Victor Hugo’s dining room in his house on the British island of Guernsey. Even the shower walls in my hotel in Amsterdam had it. And if you really fall in love with it, you can take a factory tour and painting workshop and create your own masterpiece. Pedal around the city on a bicycle. Hunt for the perfect souvenir at the sprawling outdoor Markt. Spy a wedding at the beautiful City Hall. Look up at the impressive architecture and the heraldic shields of the Gemeenlandshuis. Admire the exotic Central Station.